Our Jungle Certificates are a great reward for children for their effort and achievements during paediatric vision testing. The animals are happy and wear their glasses and eye patches with a smile. You can simply insert the child’s name and add the success they have achieved. 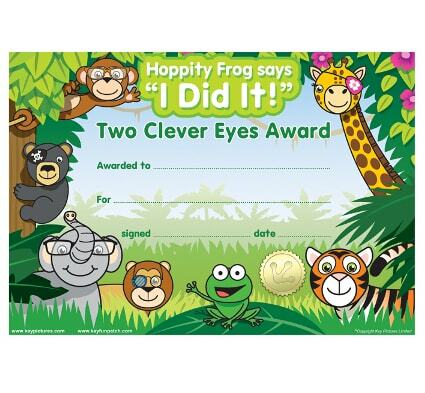 Our Jungle Certificates are A5 in size and part of the Hoppity Frog series including the ‘Hoppity Seal of Approval’. Please choose between packs of 100 or 500. You may also like our Patch or Glasses Charts.